The Ukraine conflict is having serious consequences not only for Russia and Ukraine, but it also potentially threatens to damage the still frail economic recovery in Europe. 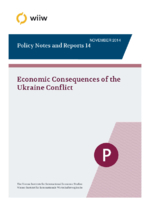 In Ukraine, which is the main victim of the conflict, the economy may decline by up to 8% this year. In Russia, the costs of the conflict are estimated to be in the tune of 1% of GDP in 2014-2016, primarily on account of increased investment risks. The effects on the individual EU countries differ depending on their exposure to the Russian market: the Baltic States, Finland and several other new EU Member States are generally most affected. The impact on Austria is expected to be relatively modest. Austria is not overly exposed to the Russian market. For the EU as a whole, there are five industries where the share of Russia in total exports exceeds 3%: textiles, pharmaceuticals, electrical equipment, machinery and transport equipment. On the assumption of a 10% loss in exports of goods and services to Russia, the estimated GDP loss would be about 0.4% for Lithuania and Estonia, and less than 0.1% for Austria. In absolute figures, Germany might lose around EUR 3 billion, followed by Italy (EUR 1.4 billion), France, Great Britain and Poland (EUR 0.8 billion each). Austria could lose close to EUR 300 million in this scenario. The estimated impact of Russia’s ban on agro-food imports from the EU imposed in August 2014 is expected to be the highest in the Baltics. These losses are undoubtedly painful, yet manageable (a trade decline bigger than 10% would obviously lead to greater losses). The question is whether these losses are justifiable and will achieve the desired effects – to change Russia’s behaviour in Ukraine and beyond.